A series of free, online High School Geometry Lessons and solutions. The following diagram shows the midsegment of a triangle. Scroll down the page for more examples and solutions of geometric construction. 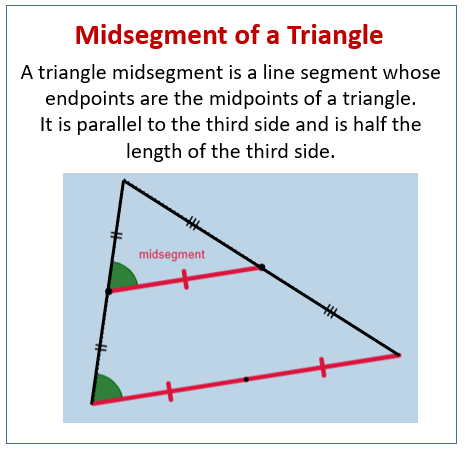 A triangle mid segment is a line segment whose endpoints are the midpoints of a triangle. The triangle mid segment is parallel to the third side (the side that does not contain an endpoint). Also, the mid-segment is half the length of the third side. How to define a midsegment in a triangle? A point of concurrency is where three or more lines intersect in one place. Incredibly, the three angle bisectors, medians, perpendicular bisectors, and altitudes are concurrent in every triangle. There are four types important to the study of triangles: for angle bisectors, the incenter; for perpendicular bisectors, the orthocenter; for the altitudes, the circumcenter; for medians, the centroid. How to define point of concurrency; how to identify the four main points of concurrency in triangles? A circle is circumscribed about a polygon if the polygon's vertices are on the circle. For triangles, the center of this circle is the circumcenter. A circle is inscribed a polygon if the sides of the polygon are tangential to the circle. For triangles, the center of this circle is the incenter. Circumscribed and inscribed circles show up a lot in area problems. This video provides the steps to constructing a circle that is circumscribed about a triangle. The point of concurrency of the three angle bisectors of a triangle is the incenter. It is the center of the circle that can be inscribed in the triangle, making the incenter equidistant from the three sides of the triangle. To construct the incenter, first construct the three angle bisectors; the point where they all intersect is the incenter. The incenter is always located within the triangle. How to construct the incenter using a compass and straightedge? How to construct an incenter and inscribed circle using a compass and straight-edge? With three angle bisectors, you construct an Incenter. An incenter is the center of a circle which can be drawn inscribed inside a triangle (just barely touching the three sides).